Photo by Moyan Brenn. Used under a Creative Commons license. I am taking the online course Introduction to Nutrition – Food for Health from Wageningen University and lately we’ve been talking about the role of carbohydrates in health and ways to reduce sugar consumption. I shared some of my own sugar-reduction habits on the discussion boards there and decided to also share them here for readers who want to bake with less sugar. 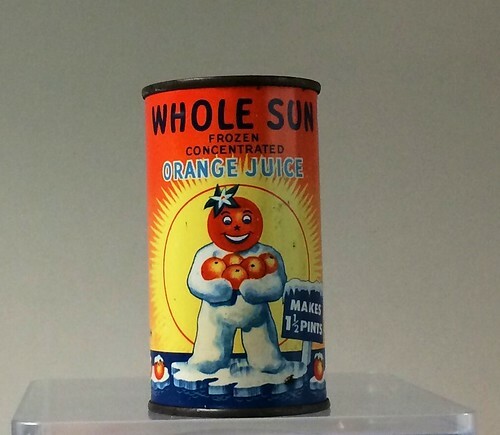 Whole Son concentrated orange juice. Photo by the National Museum of American History and used under a Creative Commons license. Initially when I started reducing my sugar consumption, I replaced refined sugar, honey and syrups with fruit juice concentrate. My favorite recipe was chocolate-orange cake made with orange juice concentrate. But while fruit juice concentrate can add phytonutrients and wonderful flavors to your cooking, it’s hardly sugarless. According to the nutritional information on the side of my orange juice concentrate can, the naturally occurring sugars in orange juice concentrate amount to about 4 grams per tablespoon, or 1.5 grams per teaspoon. That’s significantly lower than the approximately 4 grams of sugar per teaspoon of honey or table sugar. Alas, many of the published recipes I found used higher amounts of concentrate than they would have used of table sugar or honey. They would substitute fruit juice concentrate for sugar in a 2:1 ratio rather than a 1:1 ratio, almost eliminating any advantage over refined sugar. So fruit juice concentrate can be a good replacement for sugar when used thoughtfully, but it’s important to look at proportions and figure out if you are using it in a way that reduces total sugars per serving. Photo by Paul, on Flickr. Used with under a Creative Commons license. Another trick is to replace part of the honey or syrup in a recipe with unsweetened applesauce. Applesauce naturally has some sugar in it, but not as much as honey does. Plus, applesauce has phytonutrients and fiber. Around here, it’s also dirt cheap: I can pick apples for free from local trees, then make them into applesauce that I bottle for year-round use. My last approach is to use non-sugar sweeteners. These can include sugar alcohols like xylitol and erythritol, which have fewer calories and less of an effect on blood glucose levels than sugar, or non-caloric sweeteners like stevia or sucralose. I prefer the sugar alcohols because they don’t have an aftertaste, although stevia usually tastes fine to me in fruit-based dishes. All of these sweeteners are expensive and (like sugar) none of them are essential to a healthy diet, so I tend to purchase them with coupons and use them sparingly. I hope these ideas were helpful. 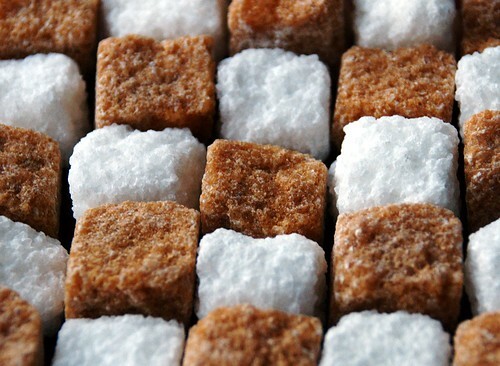 Do you have any tricks for cutting down on sugar use in the kitchen? Have you ever run into any disasters when trying? Let me know in the comments! Hello there! Replacing the sugar with aplesauce is a good idea, got to try that myself one of these days. I've baked muffins and used pureed strawberries and bananas mixed in the batter for sweetness and they came out pretty good. Medjool dates are another thing that I've tried to use to replace sweeteners. Those are great ideas! I forgot that I cut down the sugar and throw in an extra banana when making banana bread, because more that's my standard recipe :-) It's been a long time since I've used dates, but I remember them being especially good in brownies. Do you have a particular use for them? Brownies - you read my mind! :) I've also pureed them with a little bit of water so that it turned into a really sweet "sludge" - so not an appetizing way of describing it, sorry - and just mixed it in with my batter instead of honey when making these little coconut macaroons, which turned out delicious. Oh, and when making these yummy almond and nut "protein bars" the only sweetener I used was dates as well. Most of my use for them involves pitting them and then running them through the Magic Bullet or food processor. ​Great post as always. I've done the same thing as kit and used mostly pureed dates in baking. I've also used bananas. But luckily I kicked the sugar habit almost a year ago :). I've found it quite staggering just how much sugar is required for so many cake recipes. I like the sound of using unsweetened apple sauce and I recently saw a video on making your own apple sauce (it looks so easy). Not sure why I never saw this comment until now! Applesauce is very easy to make. I tend to make huge batches (at least a few gallons) of it every fall that I can (bottle) for use throughout the year, so hopefully this fall I'll get a chance to post a tutorial of my process. I tend to use it a lot in cakes and muffins. As a warning, in case you've not seen all of my blog posts; cakes present quite a challenge, if you're going to attempt them in your new halogen oven. They can crisp the top quite easily but leave the bottom and middle very soggy. I've been reading about this recently and one source suggests decreasing the oven temperature.